With spring comes ticks. Hunters who roll around in the grass seeking cover from spring turkeys know this well. The law of averages says that as much time as you spend in the outdoors, you’re likely to get a tick. Chances are more than one. As someone who’s had his fair share, having to remove a tick isn’t fun. The whole idea that a bug has burrowed into your skin is one to make anybody squeamish. But it’s in you so best take care of it as quickly as possible. 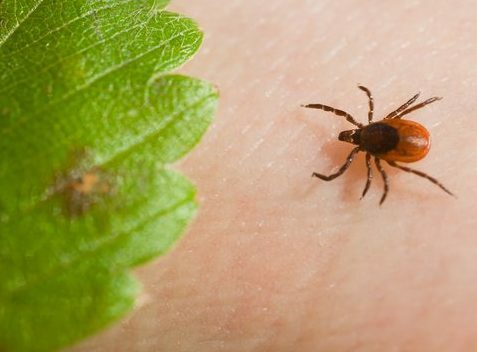 The Centers Disease Control says there is one fool proof way to remove a tick and that’s to get a clean tweezers, grip where its head meets its body and pull it straight out. Anything else could result in infection or worse yet disease as the leading carrier of lime disease. Knowing how to remove a tick is especially important knowledge for animal lovers as pets can often be susceptible to ticks because they travel low to the ground and the ticks are easily concealed. If you talk to old-timers they have plenty of ways to remove a tick. Thankfully, most have been dispelled as myths. Here are four to stay away from, which may even end up doing you more harm than good. Yea, that sounds like it makes sense. The idea is to hold a flame or the burning tip of a cigarette up close to the tick so that it will be smoked out or so uncomfortable that it has no choice to vacate it’s burrow. In reality, of course, this doesn’t work. And if the tick was worried about the heat, why would it crawl out closer to the source. If anything it would be driven to burrow even deeper. This method is based on the theory that a tick can be suffocated. To enact this concept, the idea is to paint over the tick with nail polish or Vaseline, something that will starve the tick of oxygen. But the truth is, ticks do not breath very much once they are preying on a host and to truly suffocate a tick would take likely days. The longer you leave a tick attached to your body, the greater chances that will transmit something to you or your pet. Many people have this idea that you can grab the tick with a pair of Tweezers and twist it out of its burrow as if the tick had screwed itself in to begin with. Quite clearly, the tick heads straight into the skin, diving head first. As time goes on it gets deeper and deeper, getting ever more engorged with blood. Small amounts of saliva can enter the hosts bloodstream, carrying with it any diseases that were picked up from the last host. For the same reason, squeezing a tick, which someone became someone’s preferred method out there, is actually one of the worst things you can do. Rather than hastening its retreat, what you’re actually doing is releasing that bacteria filled saliva further into your blood stream while at the same increasing your chances of an infection. So do what the CDC says and pull the tick straight out with tweezers. Wrap the bugger up in a tissue and flush it down the toilet or seal it in a piece of tape and throw it away so it doesn’t have the chance of spreading any further disease. And be done with it!